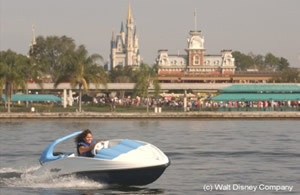 Guests can skim across Walt Disney World waterways aboard a personal Sea Raycer watercraft. These modern-looking mini-powerboats, created exclusively for Walt Disney World Resort, make waves as they cut through open water. They are environmentally sound, meeting recent federal laws requiring small engines to meet pollution control and fuel efficiency standards. Sea Raycers by Sea Ray are available at marinas throughout Walt Disney World Resort. Guests can also experience water adventures with sailboats, pontoon boats, canopy boats, pedal boats, rowboats or canoes at select Walt Disney World marinas. Not all boat types are available at all marinas. 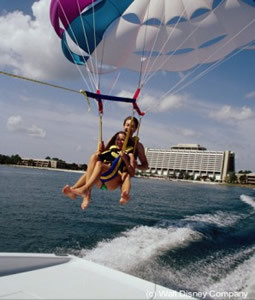 The sky is the limit when guests take a parasailing adventure high above Bay Lake. Single and tandem fliers can have a bird's-eye view of Magic Kingdom at altitudes nearing 600 feet for 8 to 10 minutes. Instead of the traditional water approach, the uniquely designed boat enables a "dry" take-off and landing from the back of the boat. Summer season flights depart every half hour between 9am and 4:30 pm. Winter season flights depart every half hour between 10am and 4:30 pm. All fliers must be over 5yrs. old. We require at least 125 lbs. and no more than 330 lbs. total weight in the parachute. If a flier is under the minimum requirement, he or she may accompany another child or adult to reach the minimum weight. Minors under the age of 18 must have an adult present to sign waivers prior to departing on your trip. Available at Sammy Duvall's Watersports Centre at Disney's Contemporary Resort. Reserve times by calling 407 939-0754 or book online at www.sammyduvall.com. Start your day with a morning guided excursion around Bay Lake and Seven Seas Lagoon. Or ride on your own in the "free ride" area on a 3-seat personal watercraft. All Personal Watercrafts are capable of holding up to 3 people with a combined weight under 400 lbs. Drivers must be over 16yrs of age and must bring either a state issued drivers license or permit and a photo I.D. with them at the time of check in. No exceptions will be granted. A credit card is required to be held as a damage deposit. Minors under the age of 18 must have an adult present to sign waivers prior to departing on your trip. Summer season: trips available at 8am and 9am. All year trips are available from 9am. Winter season: trips available at 10am-4pm. The recipe for adventure at Disney's Contemporary Resort includes skis and speed at Sammy Duvall's Watersports Centre. "Air time in no time" is the motto when guests slalom, kneeboard and wakeboard on Disney waterways. Guests can book tournament-level ski boats and ride the waters of Bay Lake near Magic Kingdom on skis, boards or tubes with guidance from a professional instructor. Try your hand at kneeboarding and have an exhilarating outing in the Seven Seas Lagoon. Get into a tube for a real splash. Hop on a boat with up to five people plus a professional driver and instructor for fun in the sun. Bob in the water being pulled along behind the speeding boat. Each boat carries up to 5 guests.